By many measures, Hong Kong is one of the most expensive cities in the world. But for every five-star hotel, luxury boutique and gourmet restaurant, there’s a budget room, quaint flea market and cheap dimsum stand waiting in the wings. In fact, apart from high accommodation costs, Hong Kong is a great destination for budget travelers, with its cheap public transport, vibrant street food scene and plentiful sights and attractions. Even if you’re low on cash, there is never a shortage of things to do. Here are seven of the best free (or nearly free) ways to experience Hong Kong on the cheap. Take the Star Ferry across Victoria Harbour. Some call it a commute; others call it a bargain way to cross one of the world’s most scenic harbors. The Star Ferry has been shuttling people across Victoria Harbour for more than a century, with its most popular route connecting Central Terminal on Hong Kong Island to Tsim Sha Tsui in Kowloon. The view from either side is breathtaking. Fares run between HK$2 (US$0.25) and HK$3.40 ($0.44), depending on what day you’re traveling and whether you’re sitting on the upper or lower deck. Drink medicinal tea with healing properties. Locals line up around the block for a cup of the famed ya sai mei at Good Spring Company Limited, one of Hong Kong’s oldest herbal pharmacies. The bitter tea is said to have immunity-boosting powers, and Good Spring’s formulation is a result of years of experimentation by the pharmacy’s original proprietor, whose grandson now runs the shop. A cup of the cure-all will cost you HK$7 (US$0.90). Ride the world’s longest covered escalator. The Central Mid-Levels escalator system is the longest outdoor covered escalator system in the world, extending 800 meters and connecting the hilltop districts of Hong Kong with the rest of the city. The system, made up of 20 escalators and three moving walkways, acts as free public transportation for Hong Kong’s working classes. Tourists can hop on the escalator at any time, but be advised of its schedule: service runs downhill from 6 a.m. to 10 a.m. and uphill from 10:30 a.m. to midnight. Starts at Cochrane Street and Queen’s Road Central and ends at Shelley Street and Conduit Road, with multiple stops in between. Take a tour of Hong Kong history. Learn about Hong Kong’s fascinating past through a magnificently curated exhibition called “The Hong Kong Story” at the Hong Kong Museum of History. For just HK$10 ($1.30) you can journey from prehistoric times, to the Opium Wars, to 1960s pop culture, straight through to the return of Hong Kong to China in 1997. It’s the perfect indoor respite from Hong Kong’s suffocating heat. Eat at the world’s cheapest Michelin-starred restaurant. Tim Ho Wan might be the only place on earth where you can eat a Michelin-starred meal for under US$10. Chef Mak Pui Gor, formerly of the Four Seasons, opened this non-descript dim sum joint on a back street of the Mong Kok district to bring high quality dim sum to the masses. The waits are legendary, lasting two, sometimes three hours. But if you don’t mind getting squeezed into a table with a family of five, try venturing there solo between the off-peak hours of 3 p.m. and 6 p.m. I did and managed to get in immediately. Hit up happy hour in SoHo. Short for “South of Hollywood Road,” this up-and-coming neighborhood has a more quaint, intimate feel than other parts of Central Hong Kong. But don’t be misled – SoHo comes alive in the evenings, when its trendy bars and restaurants fill with young professionals taking advantage of Western-style happy hour specials. The deals usually kick off at 5 p.m. The best way to arrive in SoHo is via the Central Mid-Levels Escalator; get off at Staunton Road. Watch the world’s largest sound and light show. 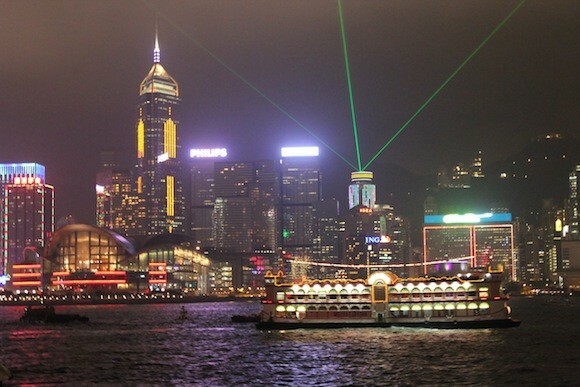 Hong Kong’s “Symphony of Lights” isn’t just one of the best tickets in town; it’s also free! The nightly spectacle, run by the Hong Kong Tourism Commission, features sound, lights and lasers from 40 buildings on both sides of Victoria Harbour. Stake out a spot on the Tsim Sha Tsui promenade for the best view, and toast to the fact that the best travel experiences can still (sometimes) be free. The “Symphony of Lights” runs nightly at 8 p.m.
Best part? The show is absolutely free. The most popular spot to view the Symphony of Lights is on the elevated Tsim Sha Tsui promenade, in front of the Hong Kong Cultural Centre on the Kowloon side of Hong Kong. Get there early, or you’ll be left jostling with tourists eager for the perfect camera phone shot. A different vantage point can be had from Golden Bauhinia Square on Hong Kong Island, from which you can catch the action happening on the Kowloon side of the harbour. More photos and video after the jump. The tram to the statue of Christ the Redeemer. The elevators to the top of the Eiffel Tower. The Santorini cable car. Any ski lift, anywhere. They’re memorable travel experiences, sure. But they’re also experiences that strike anxiety into the hearts of heights-fearing travelers, like myself. So when faced with the prospect of a thrill-inducing funicular railway ride to the top of Hong Kong’s famous Victoria Peak, I decided to take a pass. Though the Hong Kong Peak Tram hasn’t suffered any fatal accidents in its 124 years of operation, I wasn’t ready to take any chances if I didn’t have to. Plus, the bus was cheaper.The Hong Kong Peak Tram connects the city center with the famous Victoria Peak overlook, which offers stunning views of Victoria Harbour, Central, Lamma Island and the surrounding islands, as well as an over-commercialized shopping and dining complex. The historic railway has been in operation since 1888, making it one of the oldest of its kind. The original tram was made from varnished timber and operated by coal-fired steam boilers, but in the 1920s, the boilers were replaced with an electrically powered system. The current microprocessor-controlled electric drive system was installed in 1989. While the Peak Tram’s history is impressive indeed, it couldn’t make up for the thought of riding up a mountain in a rickety old cable car. Instead, I opted for the slightly more boring but much cheaper bus. The double-decker CityBus 15 departs every 15 minutes from Exchange Square in Hong Kong’s Central District, right by the Central Ferry Piers. The fare is HK$9.80 (US$1.25) each way – about a third the price of the HK$28 one-way tram ticket – and the ride takes about a hour, depending on traffic. It also offers a unique look at residential life on the Peak, which is home to some of the world’s most expensive real estate. After a winding ride up the mountain, I was deposited at the Victoria Peak complex and met with a thick bed of fog that blanketed the entire city in white. Turns out, there was no need to be so afraid of heights. “The Hong Kong Story,” a permanent exhibition at the Hong Kong Museum of History, isn’t your standard collection of artifacts. Chronicling more than 6,000 years of natural and cultural history, the massive exhibition occupies eight galleries across nearly 23,000 square feet, with more than 3,700 static and interactive exhibits. The endeavor took more than six years and HK$200 million (US$25.8 million) to complete. And with admission at just HK$10 (US$1.30) per person, it’s a bargain way to brush up on your Hong Kong history, while beating the oppressive afternoon heat. %Gallery-174071%The exhibition begins with a look at Hong Kong’s natural environment, examining the landforms, flora and fauna that make the territory unique. A full-scale forest recreation showcases the massive trees that have since been replaced by skyscrapers, along with sound bites from the island’s indigenous birds and animals. The next gallery displays artifacts from prehistoric Hong Kong, with stone tools and pottery dating back more than 6,000 years. From there, guests are led to the third gallery, on Hong Kong’s majestic early dynasties, which grew with influence from mainland China. The fourth gallery, on Hong Kong folk culture, highlights the customs of Hong Kong’s four traditional ethnic groups: the Punti, the Hakka, the Boat Dwellers and the Hoklo. A highlight is a full-scale recreation of the Taiping Qingjiao ceremony, complete with a 54-foot “bun mountain,” a Cantonese Opera theatre, a parade, a lion dance and a Taoist altar. The fifth gallery is a slightly more sobering look at the Opium Wars, which led to the cession of Hong Kong to Great Britain. The causes and consequences of the wars are examined through documentation, timelines and an informative film. From there, guests can explore the growth of Hong Kong as a modern city under British rule, with its teahouses, banks, tailor shops, pawn shops and other urban structures. The seventh gallery takes a brief look at Hong Kong during the World War II Japanese military occupation. Like in other parts of the Pacific, Hong Kong suffered heavily during the three-year-eight-month period. The propaganda video and audio clips are particularly fascinating. Finally, visitors are introduced to the development of the modern metropolis of Hong Kong in the years following World War II. The gallery includes reconstructions of a 1960s diner-style herbal tea shop, a modern cinema and exhibits from the Hong Kong trade fair, showcasing the development of Hong Kong’s manufacturing industry. With hundreds of modern artifacts and memorabilia, this exhibition has broad appeal, even for non-history buffs. The Hong Kong Story closes with a showcase of documents related to Hong Kong’s return to China in 1997 – as well as a reminder on the final placard that the city’s story is far from over. The Hong Kong Museum of History is located on Chatham Road South in Tsim Sha Tsui. Admission is HK$10 (US$1.30) for adults and HK$5 (US$0.65) for students, seniors and the disabled. On Wednesdays, admission is free. There are two types of travelers: those who would go out of their way to avoid a place like Hong Kong‘s notorious Chungking Mansions – and those who would elect to stay there. I’d probably put myself somewhere in the middle. Naturally, I was hesitant to check out the Chungking Mansions for myself. But I was also intrigued. With single rooms running from HK$150 (US$19.35) to HK$500 (US$64.50), Chungking Mansions is one of the cheapest budget accommodation options in town, stairwell drug deals notwithstanding. Anthropologist Gordon Matthews estimates that more than 129 different nationalities pass through each year. %Gallery-174068%What I found was … anticlimactic. After a number of high-profile deaths and disappearances in the 1990s, the owners of the Chungking Mansions installed an extensive CCTV system and employed round-the-clock security guards to monitor the complex. There are regular police patrols, and I witnessed no fewer than five crackdowns during my visit. Because of the heavy monitoring, Chungking is actually a quite safe place to stay, compared with other Asian backpacker ghettoes. It is also conveniently located in the heart of Tsim Sha Tsui, a lively district in the Kowloon side of Hong Kong. Luxury hotels like The Peninsula and The Sheraton are steps away, along with malls, restaurants, museums, MTR subway stops and the scenic Tsim Sha Tsui promenade. If you don’t mind the cramped quarters and chaotic surroundings, it’s not a bad budget option. Some even claim it’s a quintessential Hong Kong experience. Not all Chungking Mansion guesthouses are created equal, though. Quality varies wildly, and photos on booking sites like Hostelbookers and Agoda are often heavily edited. The best way to score a good value room is simply to show up and make the rounds of Chungking’s 80-plus options, most of which are clustered in blocks A and B. The Ashoka Hostel, consisting of nearly 100 rooms across three floors, is a popular option; their head reception desk is located on the 13th floor of Block A. The price per night depends on the month (or even the day) so don’t be afraid to negotiate, particularly if you’re traveling during off-season. The reward? A chance to experience not only a different side of Hong Kong, but also the world. One guesthouse owner showed me his logbook of guests, hailing from Ghana, Bangladesh, Holland, Malaysia, the Philippines, Germany, Japan and even America. “People from everywhere come to stay here,” he boasted. Globalization in action.